Sean Feucht (Burn Founder) will be in Calgary on June 16!! 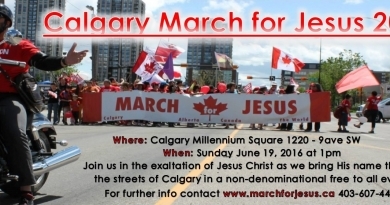 Sean and others will be leading worship at the Olympic Plaza as part of the March For Jesus festivities. This is another opportunity to lift up the name of Jesus in the heart of Calgary…don’t miss it!! Sean Feucht is a revivalist and founder of a grassroots global worship, prayer and missions organization called Burn 24/7. His lifelong quest and dream is to witness a generation of burning hearts arise across the nations of the world with renewed faith, vision and sacrificial pursuit after the Presence of God with reckless abandon. He has produced, recorded and released twelve worship albums, numerous teaching resources and recently co-authored his first book “Fire and Fragrance.” He is from Harrisburg, Pennsylvania. June 25, 2016 Artur Pawlowski Comments Off on March for Jesus in Calgary 2016 a great success!